I cannot tell you how many times I have heard professors or our overseers in the media say things like: “Conservatives just want no laws and no taxes,” which is absurd if you look at how ardently conservatives fight to bring the majority of our decision-making back down to the local level – which has everything to do with law and order! 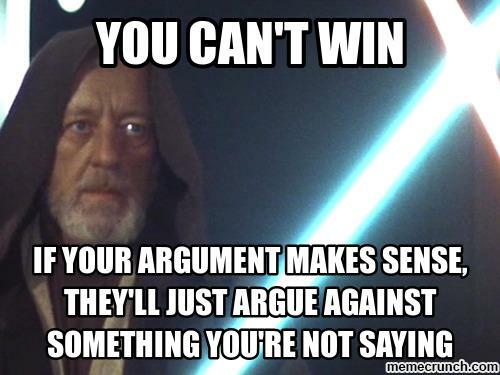 In this post I tackle the second axis to that propaganda – that conservatives want no taxes, whatsoever, not a dime! Big government specialists want you to think that their staying in power and the system being evermore layered and complicated are essential in order for you to find fulfillment in your life. But this is not true. The absurdity of the tax code is so out there, that they need to resort to these tactics in order to keep you in fear of you gaining a little bit of your life and liberty back. Here is an example: when the little nation called “America” was first established on July 4th 1776, what was comparable to a federal government back then was not even strong enough to enforce the collecting of taxes. Compare that with today, where Americans – that is, you and me – strive to comply with 74,608 pages of a federal tax code that no one can comprehend. 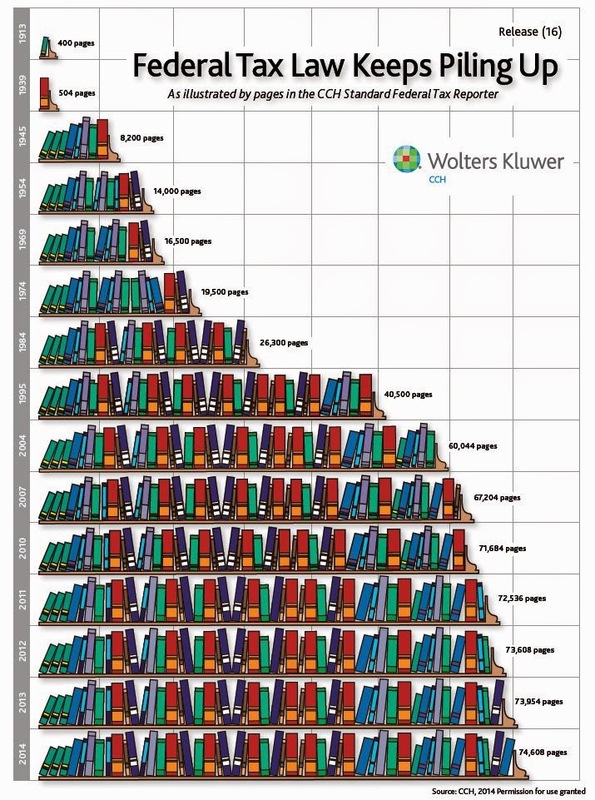 Yet we are accountable to every page of that matter. It’s like a Rubik’s Cube that never gets solved but only more complicated. The federal tax law keeps increasing and becoming more complex. Now, is this a system that we want for our posterity? For our kids, our grandkids, and so on? This has to stop! But how? The FairTax is a replacement tax that essentially does away with the IRS, the nearly 4 million word tax code, and personal taxes – as well as corporate income taxes, capital gains taxes, the death tax, gift tax, alternative minimum tax, Social Security tax, Medicare tax, and self-employment tax – and puts in their stead a solid, stable, and clearly seen sales tax of 23% at the checkout line for any brand new good or service. That’s it. No filing (personal) tax returns. No scary auditor guy. No April 15! In addition to the evaporation of 6.1 billion hours a year wasted on complying with a tax code that nobody can understand, the FairTax reform gives a prebate at the beginning of every month (hence “pre-,” not rebate at the end of the month) to every citizen of the United States. Now, you have to be a citizen of the U.S. to get one, but that’s it – no other qualifications necessary. So, if you have a social security number, which we all do, then you get money. To clarify, this monthly prebate is a monthly check that covers all the taxes on purchases made up to the poverty level. (The Department of Health & Human Services [HHS] makes these decisions anyway as to who is considered poor and who is not. So we would be using their measurement under the FairTax – might as well.) This poverty level is what one can call the “necessities of life” or basic food and medicine. So, 23% of said level is given back to the people after this reform. Put another way, the poor would be totally untaxed by the federal government. Imagine what you could do with your monthly prebate given you are among those of us who would not need it for the “necessities of life.” Save? Give? Invest? Also, the underground economy would take a hit under the FairTax. Since gangsters and criminals playing Grand Theft Auto in real life can’t evade paying for a new Mercedes or designer clothing (not to mention medicine and food! ), every time they go to purchase just one of these items they are paying federal taxes – first time, probably some of them, in years! Imagine an economy that is fueled by newer revenues and one that exists alongside a shrinking, illegitimate economy as well. Something U.S. citizen and foreigner can enjoy. Like the FairTax, a flat tax is an even tax rate across the board. The millionaire and those struggling to get by pay the same rate under this system. Notice that the rate does not change but the millionaire always pays more than those who are less fortunate. 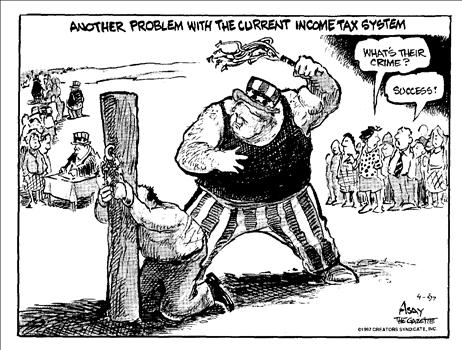 Taxation becomes less about soaking the rich and more about making it easier for poorer citizens to climb the economic ladder of success. The rich ought not to be penalized for being rich in a free country – a country that encourages people to climb that ladder of success and economic opportunity. That is where freedom is. That is where prosperity is! No, instead, this current system knocks you down before you even try. But unlike the FairTax, a system oriented around an individual’s spending, a flat tax is placed on the income side of the equation. But unlike our present-day federal income tax code, this tax plan actually makes sense. In fact, Steve Forbes argued that it can fit on a postcard it is so simple and stress-free – which has been so in the countries where it has been proposed and adopted. The flat tax “postcard” verses the 4 million-word goliath income tax code of today. You decide. Flat tax rates, you will find, are normally low so that they will not be burdensome to the poorest in the country. Thus, there are well-reasoned solutions to this ever-increasing federal leviathan which lurks over the individual in day-to-day life, but one solution that you will never hear cross a conservative’s lips is anarchy. Never! 1. They had to amend that system – the Articles of Confederation – and replace it with the United States Constitution which was at least strong enough to do that. 2. Being obsolete, personal tax returns under the FairTax would be a thing of the past, making the filing of tax returns in general shrink by 90%! Who could be against such a plan? Forbes, Steve. 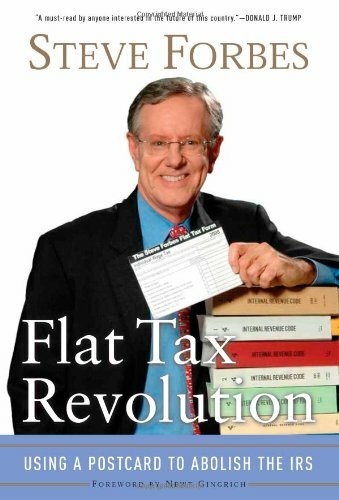 Flat Tax Revolution: Using a Postcard to Abolish the IRS. Washington: Regnery Publishing, 2005.